Today is National Simultaneous Storytime! It is the part of Library and Information week and promotes reading and enjoying books to young Australians. 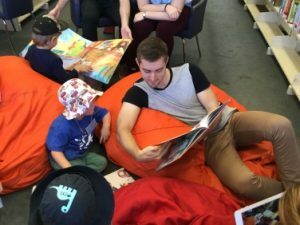 Every year a picture book is chosen from an Australian author and illustrator and read simultaneously in libraries, schools, pre-schools, childcare centers, homes, bookshops and wherever else anyone can around the country! This fun and exciting event encourages the value of reading and literacy. It addresses key areas of learning from the National Curriculum for Grades 1 – 6 and the pre-school Early Learning Years Framework. It is a great opportunity to get together and share the joys of books and reading. 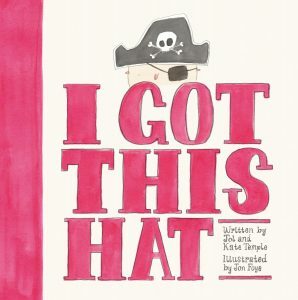 This year’s National Simultaneous Storytime book is I Got This Hat by Jol and Kate Temple, illustrated by Jon Foye. Around the country at 11am the story will be told simultaneously for all to enjoy. 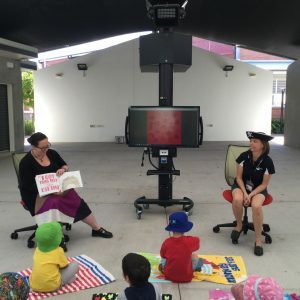 Even if you can’t make it by 11am or to a Storytime in person, have no fear for everyone can enjoy National Simultaneous Storytime. It doesn’t matter whether you are at home, school, a public library or even a university student, you can watch the video of I Got This Hat! And to top it all off (literally!) why not wear a fun hat or make your own pirate hat to show your enthusiasm and support for National Simultaneous Storytime?